PAMP Suisse is one of the world’s foremost precious metal brands, with a history that stretches back over four decades in the financial capital of the world: Switzerland. The refinery is known for its silver and gold bars, including its lunar lineup. 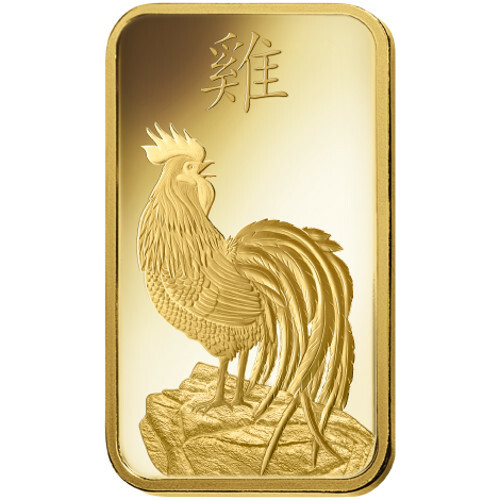 Right now, 5 Gram PAMP Suisse Gold Lunar Rooster Bars are available to purchase online at Silver.com. Arrives in sealed CertiPamp case. Part of the Lunar Series range. Consists of 5 Grams, or .1607 Troy ounces, of .9999 fine gold. Obverse features the Year of the Rooster design. Reverse includes the opposite Year of the Rooster image and identifying marks. Lunar-themed products are increasingly popular, but few mints are striking lunar designs on bars. In fact, PAMP Suisse’s lineup of gold bars with lunar-inspired designs is the preeminent option in the precious metals industry. 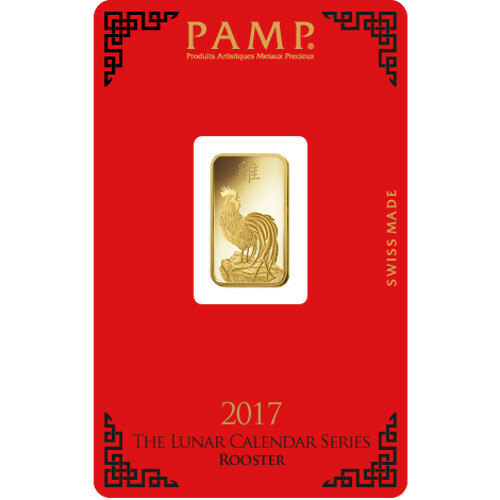 On the obverse side of all 5 Gram PAMP Suisse Gold Lunar Rooster Bars you’ll find the refinery’s exclusive Year of the Rooster design. It features a large rooster standing at the edge of a rocky outcrop, looking back behind it beyond its massive plumage on its tale. The only engraving on this face is the Chinese symbol for rooster. The reverse of the bar features the mirror image of that rooster from the other side. You still see the rooster at the edge of the rock cliff looking over its shoulder, but the image is reversed. Engravings on this side include “PAMP Suisse,” “5 G 9999 Gold,” and the individual serial number of the bar. 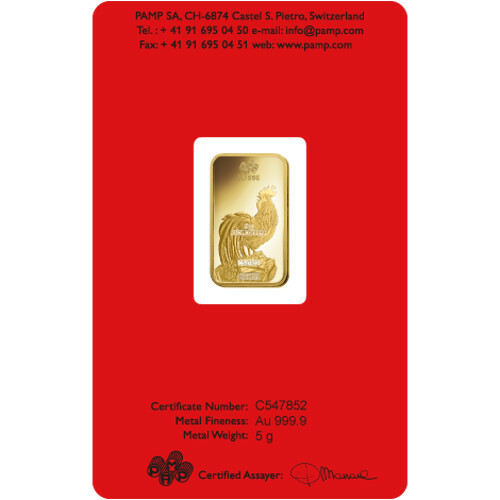 All 5 Gram PAMP Suisse Gold Lunar Rooster Bars ship to you sealed inside of a CertiPamp packaging case to protect the bar’s condition and guarantee its quality upon arrival. Each one comes with a numbered Assay card that matches the number engraved on the bar itself. PAMP Suisse lunar bars feature one-letter, six-number codes for serial numbers. PAMP Suisse was founded in 1977 in Ticino, Switzerland. Originally an independent company, today is part of the Geneva-based MKS Group. The latter is a multinational organization that deals in financial services as well as precious metals. 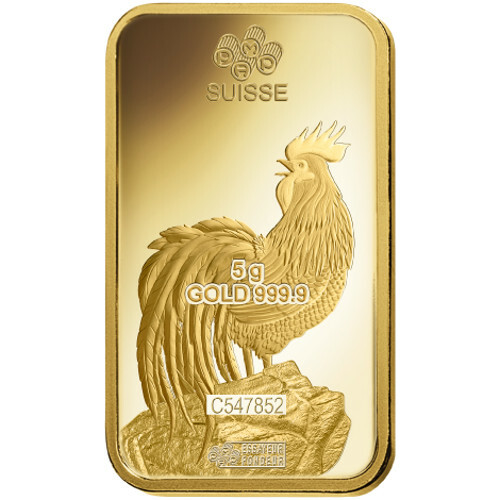 If you have any questions regarding these 5 Gram PAMP Suisse Gold Lunar Rooster Bars, please don’t hesitate to ask. Silver.com associates are available on the phone at 888-989-7223, online using our live chat, and via our email address.